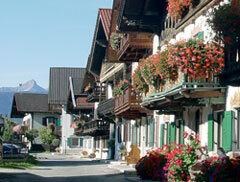 Olympia town, winter sports metropolis, hiking paradise, health resort, day-tour destination, centre of the Werdenfelser Land, hometown of Richard Strauß and Festival-location – Garmisch-Partenkirchen has a lot to offer. The gorgeous nature and mountain landscape with its almost unlimited options for sports and recreation have made Garmisch-Partenkirchen become the most frequented tourist magnet in the Bavarian Alps region. 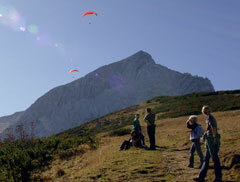 Apart from sports like skiing, cross country skiing, ice-skating, rafting, hiking, golf, tennis, fishing, mountain biking and paragliding, Garmisch-Partenkirchen and surroundings offer lots of day-tour options. From here you have eleven cable railways and a rack railway within reach. 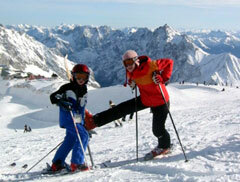 They take you for example to the top of the Zugspitze, Germany’s highest peak (2966m). 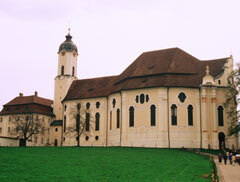 Famous sights such as the castles Linderhof and Neuschwanstein or the impressive ravine Partnachklamm are near as well.